During the 1990s, only 2 elephants were recorded in Bardia National Park, but now 60-80 elephants utilize the region. The local residents who have also re-colonized this area migrated from the hills and lack the knowledge and skill to coexist with wild elephants. 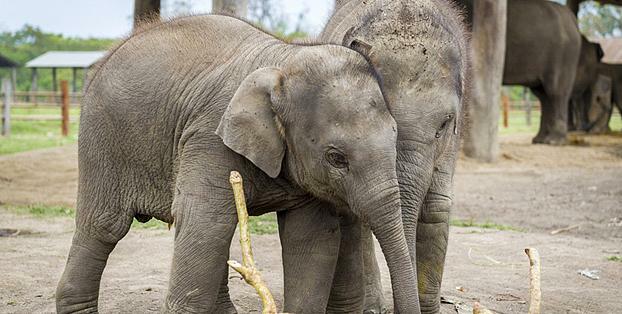 Human-elephant conflict is increasing with people losing crops, their houses and their lives and there is a lack of immediate medical support due to their poor economic status and in retaliation elephants are being killed. This project aims to minimize human-elephant conflict and its severity by creating awareness among the locals, erecting electric fencing with solar backup and installing watch towers for crop guarding. This project will also engage local people in HEC mitigation, conservation education in the community and secondary schools, and provide funding for medical attention as a result of an elephant attack. make sound by shouting, create fire flames, and guard their crops at night. But all these efforts are not sufficient to reduce the losses to a tolerable level at which people feel the conflict a natural phenomenon and owe positive attitude towards conservation of this species. The western sector of the buffer zone is more suffered by the conflict with elephant than other part of the buffer zone of Bardia National Park (BNP). This is due to the fact that the area is most remote and people frequently enter the forest for their livelihood as they don’t have other option. The higher dependency of people on agricultural activity has increased the potentiality of conflict with HEC that the animal frequently visits the farm land in search of foods. Each year conflict with elephant lost the lives of people either inside the forest (Community forest and sometimes national park) or outside the forest in their village. Except few cases, almost all the movements of the elephant in the villages are not so peaceful. The recent statistics of conflicts show that there is dramatic increase in the human wildlife conflict in the buffer zone of BNP. 53 people are killed in the conflict with human and wildlife in the last two decade among them 35 have got death in the conflict with elephant. Remaining 18 are killed by rhino, tiger and leopard. Among the 19 Village Development committees (VDCs) in the buffer zone of BNP, the project proposed 9 VDCs have faced 24 casualties within the last two decade. The rate of the loss of lives is increase in the recent years. The percent of the property damage in the western part is very high as compared to the proportion of the land area with other part of the buffer zone. The cost of damage of property and crop raiding is very huge. As the economic status of the people in this area is below than the others from outside and they are directly dependent on the forest products and agricultural activities, they are more suffered from the HEC. This project aims at minimizing the conflict between human and wildlife particularly the conflict between human and elephant with taking account the conservation of elephant and establishing a sustainable mechanism for maintain it below a tolerable state. People will adopt the tools and techniques for the mitigation HEC in a systematized manner so that the impacts of the project will sustain even after the funding cycle of the project. This project reduces the losses of properties, crops, livestock and lives of people in the area. Involving communities in the HEC minimization will make people realize some responsibilities in finding out the solution to human-elephant conflict and it will direct them act for elephant conservation.